We had an amazing turnout for the bat program on July 25th! Thanks for your participation! Stories, nursery rhymes, songs, and fingerplays. This program is designed to help children build listening and participation skills, to develop large and fine motor coordination, and to engage and sustain interest. This is a weekly program. Stories being read, conversation engagement, & art activities help children develop early social & literacy skills. This is a weekly program. A collaborative reading program launched in 2017. Loring Job Corps students visit the library once a week and read to children. The program offers these older students a positive volunteering experience and the children an opportunity to gain excitement about reading! Students involve the children in the stories by asking questions and encouraging reading. *There will be a summer break, and then Story Time for all Ages will resume September 10. 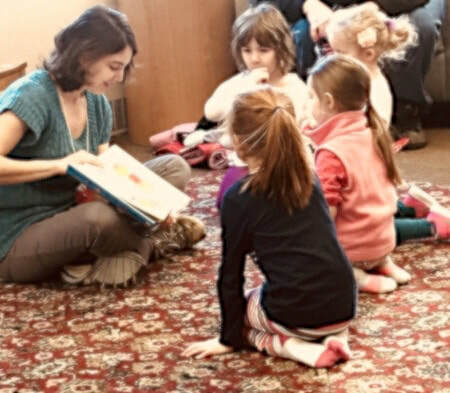 Fourth Wednesday of every Month, 4:00-5:00 p.m.
Erin Albers, Children's Librarian during Preschool program.